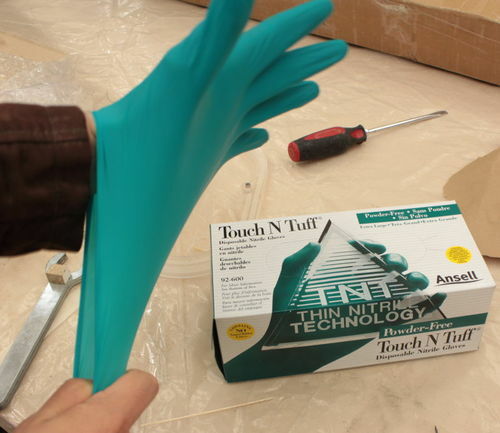 At the shop we’ve been using nitrile gloves for many years in finishing or epoxy operations. For some time they were purchased from Lowes but they were flimsy and sold in $9 bags of 15 (for one-armed woodworkers?). Later we discovered Gemplers and their 8 and 4 mil gloves and were satisfied with those. They held up well and could often be used a couple times before tossing. We tried discounted gloves from Woodcraft but those were easy to tear and weren’t that much cheaper. Then one day we realized that I’d forgotten to restock our glove supply and we needed them in two days. Gemplers doesn’t ship to us that fast so I placed an order for a few mystery boxes at McMaster-Carr and the next day we got 6 boxes of Ansell Touch-N-Tuff. These are the absolute best nitrile gloves I’ve ever seen. They’re durable like the Gempler’s 8-mil gloves but unlike most nitrile products, these stretch. A lot. They’re powder-free but getting them on and off is really easy which was always a problem with a conventional nitrile glove when worn on hot days. The cost from McMaster is $14.54 per box when purchased in quantities of 6 but they’re cheaper elsewhere if fast shipping isn’t a necessity. Even at that price, they’re competitive with most other brands we’ve used and unlike cheaper gloves, they aren’t going to rip as they’re pulled on or fall apart at the touch of a screw. If anyone purchases these, it’s not necessary to buy one size up. Just get your normal size and they’ll stretch and minimize impact on dexterity. I didn’t know this and got some extra large gloves. Next time I’ll get the large. Running out and use them often. Just purchased from Amazon 19.95 free shipping. Thanks for the review. Always looking for a better product. MC seems to carry good products, as a whole. Good vendor. Jacob, thanks for the info. I wear xl gloves and would be happy to buy whatever you have left of the ones too big for you. That would give me a way to try the glove, see if the xl is the right size and take them off your hands if you don’t use them. Let me know how many you got left and what you want for them plus shipping. Thanks for the review Jacob,they sound great. Thanks for the offer OldWrangler. Fortunately, the guy who works with me has larger hands and can put them to use so they’ll serve their purpose one way or the other. We’ve got plenty of gloves on hand though so if you want to try out a pair I can stick them in an envelope and send them your way. Thanks for the review. To toss out another option, you can buy powder free vinyl gloves at Costco, 200 gloves for around $8.00. Use ‘em all the time. Harbor Freight 7 mil nitrile gloves are pretty good 25 pairs for $10. I’ve reused them. Get the extra large, their sizes run really small. I got a box of larges and they are a tight fit for me. My hands are more like mediums. 25 pair for $10 would make them $20 for 100 gloves. Usually Harbor Freight sells for less but apparently that’s not the case here. Wanted to let you know Amazon cancelled my order. No reason. I guess that’s one of the reasons I keep paying a few extra dollars for McMaster Carr. They’ve only let me down once in what’s probably been 100 orders over the past several years.